24 • SHOPPING CENTER BUSINESS • May 2018 NEWSLINE the seller, Kimco Towne Center LLC, and the buyer, Talavi Bell LLC. Talavi Towne Center is home to tenants such as Wal-Mart, MOR Furniture, Dollar Tree, Leslie's Pool Mart and Cricket Wireless. TSCG ARRANGES $6 MILLION SALE OF SHOPPING CENTER The Shopping Center Group (TSCG) has arranged the $6 million sale of Chain O'Lakes Plaza, a 91,160-square- foot shopping center located in Winter Haven, Florida. Anthony Blanco, Lenard Williams, Mallory Silva and Tyler Freeman of TSCG arranged the transaction on behalf of the seller, an affiliate of Kimco Realty Corp. An undisclosed, Tampa- based investor acquired the asset. At the time of sale, the property was 97 percent leased to tenants such as Big Lots, Family Dollar, Jo-Ann Fabrics, Rainbow Shops and Dunkin' Donuts/Baskin Robbins. Save-A-Lot shadow-anchors the center, which also includes a one-acre, undeveloped outparcel. NEWPORT ACQUIRES RETAIL CENTER FOR $17.9 MILLION Newport Capital Partners has acquired The Plaza in Brookfield, a suburb of Milwaukee, for $17.9 million. 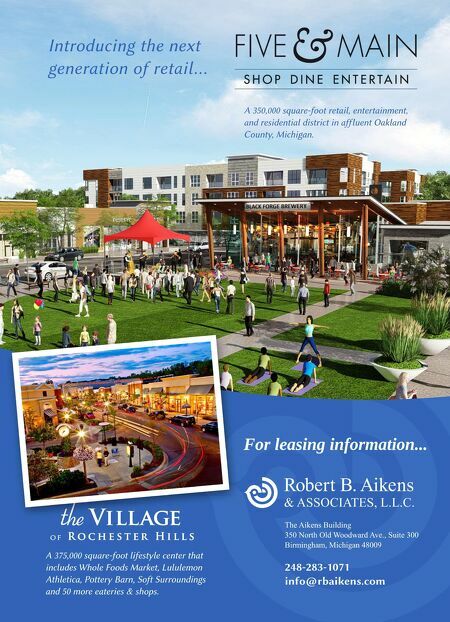 The 108,000-square-foot retail center is situated on 11 acres. The property is 99 percent leased by 22 tenants, including CVS/pharmacy, Guitar Center, Stan's Fit for Your Feet and Hooters. Rick Drogosz of Mid-America Real Estate Corp. represented the seller, IRC Retail Centers, in the transaction. 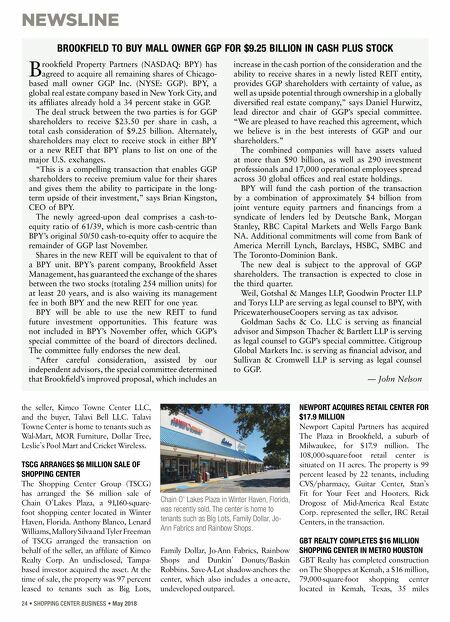 GBT REALTY COMPLETES $16 MILLION SHOPPING CENTER IN METRO HOUSTON GBT Realty has completed construction on The Shoppes at Kemah, a $16 million, 79,000-square-foot shopping center located in Kemah, Texas, 35 miles BROOKFIELD TO BUY MALL OWNER GGP FOR $9.25 BILLION IN CASH PLUS STOCK B rookfield Property Partners (NASDAQ: BPY) has agreed to acquire all remaining shares of Chicago- based mall owner GGP Inc. (NYSE: GGP). BPY, a global real estate company based in New York City, and its affiliates already hold a 34 percent stake in GGP. The deal struck between the two parties is for GGP shareholders to receive $23.50 per share in cash, a total cash consideration of $9.25 billion. Alternately, shareholders may elect to receive stock in either BPY or a new REIT that BPY plans to list on one of the major U.S. exchanges. "This is a compelling transaction that enables GGP shareholders to receive premium value for their shares and gives them the ability to participate in the long- term upside of their investment," says Brian Kingston, CEO of BPY. The newly agreed-upon deal comprises a cash-to- equity ratio of 61/39, which is more cash-centric than BPY's original 50/50 cash-to-equity offer to acquire the remainder of GGP last November. Shares in the new REIT will be equivalent to that of a BPY unit. BPY's parent company, Brookfield Asset Management, has guaranteed the exchange of the shares between the two stocks (totaling 254 million units) for at least 20 years, and is also waiving its management fee in both BPY and the new REIT for one year. BPY will be able to use the new REIT to fund future investment opportunities. This feature was not included in BPY's November offer, which GGP's special committee of the board of directors declined. The committee fully endorses the new deal. "After careful consideration, assisted by our independent advisors, the special committee determined that Brookfield's improved proposal, which includes an increase in the cash portion of the consideration and the ability to receive shares in a newly listed REIT entity, provides GGP shareholders with certainty of value, as well as upside potential through ownership in a globally diversified real estate company," says Daniel Hurwitz, lead director and chair of GGP's special committee. "We are pleased to have reached this agreement, which we believe is in the best interests of GGP and our shareholders." The combined companies will have assets valued at more than $90 billion, as well as 290 investment professionals and 17,000 operational employees spread across 30 global offices and real estate holdings. BPY will fund the cash portion of the transaction by a combination of approximately $4 billion from joint venture equity partners and financings from a syndicate of lenders led by Deutsche Bank, Morgan Stanley, RBC Capital Markets and Wells Fargo Bank NA. Additional commitments will come from Bank of America Merrill Lynch, Barclays, HSBC, SMBC and The Toronto-Dominion Bank. The new deal is subject to the approval of GGP shareholders. The transaction is expected to close in the third quarter. Weil, Gotshal & Manges LLP, Goodwin Procter LLP and Torys LLP are serving as legal counsel to BPY, with PricewaterhouseCoopers serving as tax advisor. Goldman Sachs & Co. LLC is serving as financial advisor and Simpson Thacher & Bartlett LLP is serving as legal counsel to GGP's special committee. Citigroup Global Markets Inc. is serving as financial advisor, and Sullivan & Cromwell LLP is serving as legal counsel to GGP. — John Nelson Chain O' Lakes Plaza in Winter Haven, Florida, was recently sold. The center is home to tenants such as Big Lots, Family Dollar, Jo- Ann Fabrics and Rainbow Shops.